Cuban television is great. There are five channels (I think) – I can only ever find three with regularity – but I live in a flat with poor reception. I don’t watch much TV in the UK; I’m very, very fussy. I can’t stand advertising of any sort, so watch mainly the BBC channels or, if occasionally I want to watch a commercial station, I edit out the adverts before watching. I don’t have SKY or any other non-traditional station. Cuban TV has no adverts, none whatsoever. It is a mixture of imported stuff and home-grown Cuban stuff, mainly documentaries. It is twenty four hours now, which it wasn’t back in the early noughties. Strangely, there is a mass of United States’ imports: everything from reality shows, weight loss programmes, cartoons, crime shows and films – everything. US programmes are shown regardless of content. Life is shown as the Americans want it to be shown; it is repeated here as though it is something that exists, but is nothing to either envy or comment on. The news is pretty biased. Every country has a prejudice towards itself, but Cuba is quite extreme. The news programmes, although not so plentiful as they are here, tell you next to nothing about the outside world. Every broadcast has masses of stuff about Cuba: a technological advance, a meeting somewhere discussing something important, somebody has been awarded a certificate; very occasionally there will be some mild criticism. But there are only two main hour long news programmes per day with a few fillers in between. Foreign news is given about two minutes on a normal day, perhaps longer if anything noteworthy has happened. Sports news is hard to decipher; there is much about baseball, anything else that Cubans have been doing: swimming, judo, football, but I find that for long periods the announcers just talk; of course not understanding ninety per cent of what they say doesn’t help, and they seem to talk for much longer without showing any images – I noticed this on all the programmes; there seems to be much more dialogue, they stay in scenes for much longer. This applies to a whole variety of broadcasting because although much of their television is from the US, there are also Brazilian and Argentinean soap operas, English programmes; it seems to be a Latin American thing – needing many more words to say the same thing. There is an hour long discussion programme just before the evening news, where events of the day are debated at length. Apart from that there is an eclectic mixture. There has been something on China every day (a pending deal? ), but that may not be so unusual – back in the UK there have been many programmes on China too. Strangely, bearing in mind the bias of the news, US television makes up about a third of the broadcasting. It is not censored at all. Whereas the internet is practically banned here, so that Cubans cannot learn what is going on in the outside world, US television provides a constant reminder that just across the water, life, apparently, is much easier. It seems that the way of life is regarded as inferior, nothing to be sought after, just here for your amusement. Of course Cubans don’t entirely believe in the US stuff. It’s treated as propaganda; for all the wealthy, happy people, the news sometimes points out that there is no free health care, that millions live below the poverty line, that the economy is collapsing and life is not at all as it is represented most of the time. The TV is very well organised now, and professional. There are many, many films, often very recent, more recent than those available to me in the UK. Sunday is film day on one of the stations, twenty four hours of film, at least half very recent. When I first came to Cuba there were only two stations, and the schedule was fairly disorganised. In many ways I preferred that – you never knew what you were going to get, but it was often interesting – perhaps a two hour documentary about Bob Marley as a kid’s programme, followed by a film, followed by sport. Children are very well catered for and treated as mini-adults. There is still no advertising here (although they advertise themselves a lot), which is fantastic for me. I do fear that soon they will change that, though. The economy desperately needs a boost, and I’m afraid that advertising will do it no harm. Perhaps they will manage to do it tastefully. I hope so. 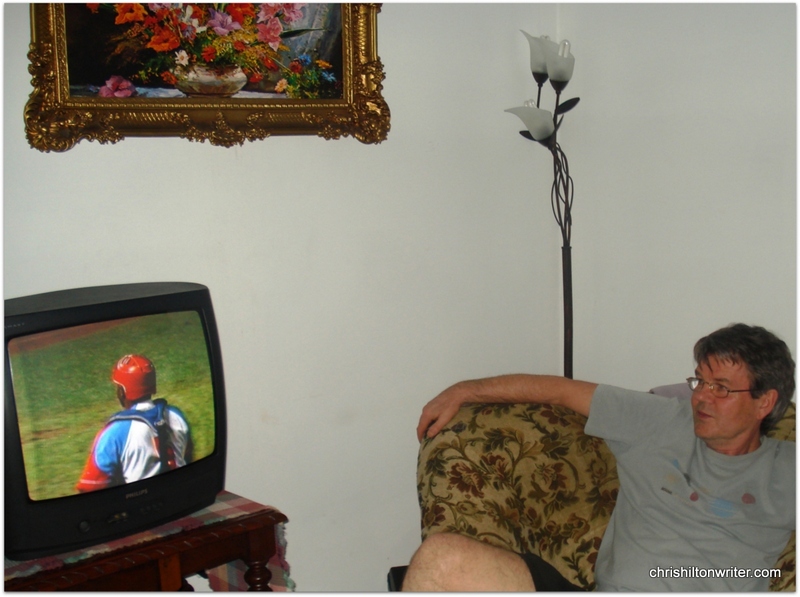 This entry was posted in Cuba, Cuba Life, Writing and tagged cuba, Cuban television is great, Havana, living abroad, living below the poverty line, television, tv, United States’ imports by Chris Hilton ~ Writer. Bookmark the permalink. It’s a bit more sophisticated now (I too miss the old times), but it’s still quite a mixture. Much more organised but you’re never quite sure what’s coming next. And no adverts (they advertise themselves much more). I love it. Good to hear from you.